1.Buckle design for controller box,easier for controller assembly and debugging,large space to hold controllers. 2.Two adjustable slide rails for you to adjusted length of battery box. 3.Flexible buckle on slide rails,which can lower much rattle from battery shaking when you're riding. 4.Discharge socket is embedded at the bottom of battery box which has good waterproof performance. 5.6PIN discharge socket was designed which has many kinds of wiring, such as monitor the parameter of battery of control the rear light. 6.30Amps automotive blade fuse holder was designed on the box. 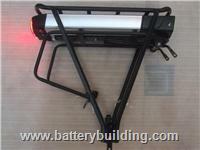 7.Rear light(Spanninga/RLL）has been installed at the bottom of battery,unique structure design. Many kinds of rear lights can be selected, such as battery version,dynamo version,E-bike version.Brake signal and steer signal can be showed on the rear light through the 6 PIN socket.Rear light approvals TPL.BS.GS.E-Mark. 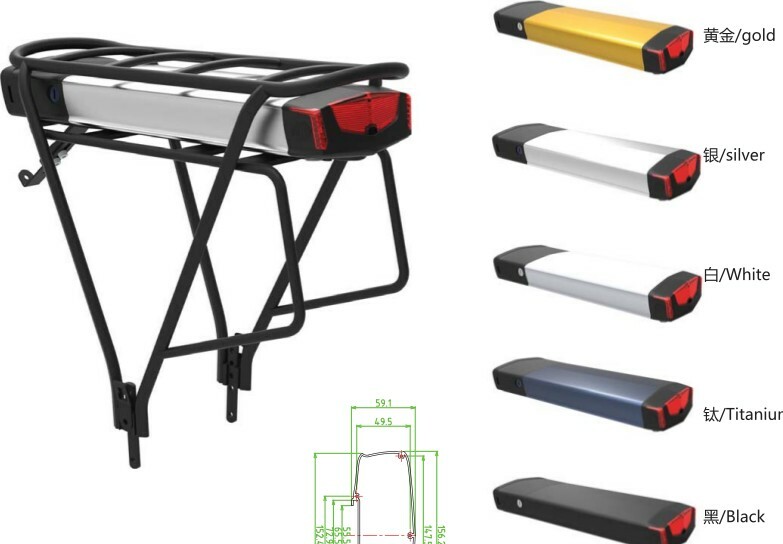 9.Holder of rear light and battery box are discrete designed,easier for you to assemble. 10.Handle location was designed at the bottom of battery box which can be removed convenient. 11.The switch can control PCM.